A summary of today’s show: Cardinal Seán’s homily for the Chrism Mass on Tuesday of Holy Week calls on priests to humility and courage and greater immersion in the Word of God in order to be strengthened in their vocations and to be united in Christ for their mission. 1st segment: Scot said we began Holy Week this past Palm Sunday. There are so many powerful opportunities for learning more about our Faith and getting closer to Christ this week. Today we are going to discuss the Chrism Mass, which occurred earlier today, and then look ahead to all the liturgies of this Holy Week. All Christians are anointed because all are filled with the Spirit’s gifts for the building up of the church and the church’s service to the world. In every local church one Christian presides in love and orchestrates the church’s ministry: this is the bishop, or chief pastor. It is not surprising, therefore, that the most ancient liturgical witnesses designate the bishop as the consecrator of the sacramental oils. Although priests once blessed the oils of the catechumens and the sick and may do so in some circumstances, only the bishop may consecrate the chrism with which the baptized are sealed at confirmation and ordination. This rite is one of the last rites of preparation before the Triduum begins. Before the local church baptizes, it prepares the chrism which will be used in the Vigil. This celebration has always retained a special character of priestly collegiality. Even in the centuries when eucharistic concelebration had disappeared from the church’s life, the ritual for the blessing and consecration of oils retained strong elements which reminded all that ministry in the church is never the work of an individual but of a community of ministers of different gifts and responsibilities. The present celebration of the rite has been restored as a full concelebration of the bishop with his clergy and with the full participation of the laity. Scot welcomes Father Chris O’Connor our Tuesday co-host. What does the Chrism Mass mean for him as a priest of the Archdiocese of Boston? Fr. Chris said it is a reaffirmation of the priests to the Lord in a special way and it’s powerful to do that with your brother priests. It’s a beautiful celebration of the priesthood with the bishop. It is a priestly fraternity. It is wonderful to look around the cathedral to see so many priests who have rendered service to God’s family. Scot said it is amazing to see all the priests that are there and the diversity of ages, ethnicity, and national original. Fr. Chris said what unites us is faith in Jesus Christ. He said there is also the practical reason for them to come together, which is to get the oils that they will use in their parishes throughout the year: the oils for baptism and anointing of the sick and confirmation. Scot said Cardinal Seán gives one of his best and one of his longest homilies each year at the Chrism Mass. In many ways it is a message directly to priests and indirectly to all of us who support our priests and minister with them in the Church. We’re going to discuss many elements of his homily today. Fr. Chris said it was a great and rousing homily. Father Chris and Scot are joined by Father Michael Barber, the new director of spiritual formation at St. John’s Seminary as of last Fall. Fr. Barber’s first connection to Boston was when he was on the apostolic visitation team implemented the Vatican and he was sent to Boston. He had a very positive impression. He also got to know many Boston priests during his time as a military chaplain. * Saint John’s new Director of Spiritual Formation, Father Michael Barber, SJ grew up in San Francisco and Sacramento, California. He followed the normal 12 year course of Jesuit studies, with philosophy at Gonzaga University, Spokane, and Theology at Regis College, University of Toronto. * Ordained in 1985, he was sent for two years of missionary work in Western Samoa, Polynesia. He was then sent to the Gregorian University in Rome to study and teach Dogmatic Theology. Father Barber’s research centered on the unpublished sermon manuscripts of Blessed John Henry (Cardinal) Newman. From Rome, he was sent to Oxford University as a research fellow at Campion Hall, the Jesuit college at Oxford. He subsequently was elected Bursar and tutor in theology there. * He later was appointed by Archbishop (now Cardinal) William Levada as Director of the School of Pastoral Leadership in the Archdiocese of San Francisco, followed by eight years as Director of Spiritual Formation and assistant professor of theology at St. Patrick’s Seminary in Menlo Park, California. Father Barber was commissioned in 1991 as an officer in the U.S. Navy Reserve, and currently holds the rank of Commander. He was called up for the invasion of Iraq in 2003 as Catholic chaplain to the 6,000 Marines in the 4th Marine Air Wing. He is currently assistant division chaplain to the 4th Marine Division, USMC. Fr. Barber recalls attending the Chrism Mass in the Archdiocese of Verona, Italy, and how every single space in the cathedral being filled by priests. They also had the custom of presenting new seminarians to the bishop at that Mass. Triduum means three, referring to the three days of Holy Thursday through Easter Sunday. These days represent the summit of all we believe as Christians. Scot said that if you wanted to start to take your faith seriously, this is the week to do it by focusing on the liturgies of this week. Clips from Cardinal Sean’s homily will now be played and discussed. At times the demands of one’s vocation can seem overwhelming. It is truly a costly grace. And so it is with the priestly vocation. There are always more and more demands, more instructions from headquarters, new programs to be implemented, the bishop’s latest brainchild. Today, at the Chrism Mass, I am happy for the opportunity to be able to say how much the whole Catholic community appreciates the tireless work of our priests and as your Bishop, I am particularly grateful for your generous dedication to ministry. These are very challenging times for the church. Business as usual is not enough if we are going to be able to fulfill our mission. We have to go the extra mile, turn the other cheek, give our tunic along with the cloak. Yes, our vocation is a costly grace, but at the same time it’s a bargain. It is a beautiful life. And together, we can make it more beautiful. Our Chrism Mass gives us an opportunity to reflect on how precious our priesthood is and to rededicate ourselves to our vocation. As always, we look to Christ, the High Priest and Good Shepherd, to gain insight into our calling. Business as usual is not good enough for the Church. Fr. Chris said we can’t be complacent. People aren’t coming to us, we have to go find them. Fr. Barber said humility and courage are tied together because only a humble man will have the courage to get up in the pulpit and preach the Word of God even when he knows some people will not like what he has to say. He has to have the humility to know he answers to a higher authority. Priests could say sometimes, “He must increase and I must increase with Him,” but that doesn’t work. Fr. Chris said this is a particular and new tack that the cardinal is taking from the usual image. If priests are going to proclaim the truth, they will have to expect pushback. Narcissism and an exaggerated sense of self importance, preclude a real conversion and prevent one from functioning as a prophet leader. Fr. Eugene Hemrick in his Habits of a Priestly Heart speaks of the need to resist the most serious foes that can take the heart out of our priesthood: resentment, careerism and clericalism. Priestly humility is the antidote to these cancers. Some day the Pope should get all the bishops and priests together in St. Peter’s Square and say to us: “Repeat after me, in the words of John the Baptist: ‘I am not the Messiah.’” It may come as a shocking revelation to many bishops and priest who enjoy a messianic complex. But it is very liberating to cast off this fiction. It is rooted in the same pride that makes us so competitive. Fr. Chris said it made him reflect like this was a mini-retreat, to be challenged to examine how he had to work on these things himself. The Cardinal challenged the priests to reflect during Holy Week on how they can become better priests. Scot said there often expectations of priests to function like messiahs. Fr. Barber said some priests feel like they have to be at the center of things at Mass, to entertain. But he sees more and more churches being renovated where the presider’s chair is moved from the highest and most central place. A priest who is humble knows that he needs others. In the face of his own limitations, he accepts his role as a prophet leader. He knows that he is gifted in some areas and not in others. The humble priest realizes that we are interdependent, and together we can do what we cannot do alone. The humble man believes in this togetherness, being part of a team and seeking this support from his brother priests and offering it to them. The proud man aspires to be a star, a lone ranger, a messiah. Fr. Chris said it’s very scriptural. The apostles were sent out by Christ, two by two, never alone. The priests work as a body for the good of others. The lone star will burn out without a connection to others. Fr. Barber said no one priest has all the qualities of Christ, but all the priests of the Church together will reflect in some way or another the necessary qualities of Christ. Priests are sometimes uneasy with accepting and exercising leadership in a world that is often suspect of its leaders. The uneasiness also comes from our own personal insecurities, fear of conflict, problems of self-esteem, fear of rejection, worries about taking responsibility for difficult decisions. I always say that in Boston every decision is a dilemma. Today, the priests face new challenges: ministering in a time when the number of priests has declined and the average age has risen. Often people have high, even unrealistic expectations of priests. The consumer mentality by which priests are to provide quick, efficient and friendly service like people expect from salespersons or hotel clerks. Fr. Chris said there would be no problems if people understood that God loved them. Do you know that you are loved by Christ, because if you don’t know that how will you help other people discover Christ’s love for themselves? Scot said the consumer mentality causes laypeople to expect priests to be service providers. That is not the identity of priests. Fr. Chris said that is exactly right. We need to rid ourselves of a country club mentality in the Church where we come and go as we feel like it. Scot said as a parent, he has to remind his children that he is not there to simply respond to their wishes, but to lead them and raise them as strong adults. Fr. Barber has known priests who couldn’t preach a homily, but where great one on one and others who were vice-versa. He sees seminarians come in from the world with all its distractions, but the men who struggle with their own temptations will make great confessors. Living faithfully and ministering effectively demand courage of the priest. This virtue is built up by continuous acts of courage: facing obstacles, resisting temptation, not walking away from difficult situations, making decisions, teaching the hard words of the gospel. Luckily it does not depend entirely on us. We are not Pelagianists. Our prayer life, our priestly friendships, the spirit who anointed us in our ordination, all help us to acquire the courage we need to be priests and prophet-leaders to God’s people. Fr. Barber recalled Archbishop Vigneron facing an impossible situation in a former diocese that he was confident that if the Lord wants success, He will make it happen. Fr. Chris said priestly friendships are a great help. No priest desires conflict so when it happens, it is great to have the support of brother priests to give feedback. The Holy Spirit is with us and stays with us. Scot’s favorite part of the homily is the Cardinal saying that courage is a virtue and that is built up by acts of courage. Our task is not to impart information, but to be messengers of God whose word is a two edged sword, whose Gospel brings life and meaning to people. To do that, we must learn to love the Word of God that will nurture the contemplative aspect of our vocation. Moses, the Prophet, climbs the mountain and there basks in God’s presence, receives His Word, and then comes down. His face is glowing from being in God’s presence. We must spend time each day with God and His Word if we are going to be God’s messengers with fire in our belly and God’s glow on our face. Fr. Barber said God’s Word is a two-edged sword because it always has a bite to it. The role of the preacher is to comfort the afflicted and afflict the comfortable. Also he likes that Cardinal Sean says that your homilies must be prepared on your knees. The priest is a conduit between the Holy Spirit and people’s hearts. Fr. Chris said people can be so busy in other people’s lives that they forget their own call to holiness. Scot said his dad taught him that the more you work for something, the more you receive. The work of the priest to receive more and give more is the work of prayer. It is not enough for a parish priest to be personally holy. He also needs to have the skills to lead others to holiness. Fr. Ronald Knott has a good definition of Spiritual Leadership: “The ability to influence another through invitation, persuasion and example to move from where they are, to where God wants them to be, especially through the skillful use of the pulpit.” He calls Catholic pulpits buried treasures waiting to be claimed. The prophet leader has a special challenging task of reaching out to the segment of God’s people who seldom frequent the sacraments or attend Mass. Fr. Knott refers to them as: “The mad and the sad; the ignored and the bored.” Our motivation to accept this challenge must be our love for God and for His People. Fr. Barber said a good preacher has the ability to interpret the events and actions in people’s lives through the Word of God. Don’t give up, keep on striving, keep faith, and know that they are planting seeds. The priest never knows where the seed goes or when it will ever come to fruition. Fr. Chris said the priest makes a return gift of his life when he knows how much God loves him. With fewer priests and higher demands, the priest needs to know where he is being fed and that is through the Word of God. If the priest doesn’t have the Word of God how will he share it with others? Scot said Cardinal Sean said in his Ash Wednesday that if we’re standing still in the spiritual life, then we’re falling behind. At the Ordination ceremony—all the priests come forward to lay on hands, and again—all come forward to give the kiss of peace. The new priests’ hands are anointed with the very chrism that this same presbyterate blessed, together with the Bishop, a few months before. All of this to indicate our unity, our oneness with Christ and with each other. 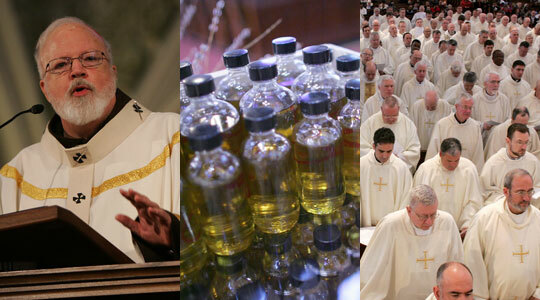 And today in this Chrism Mass, we renew our priestly promises together. And it is together that we must live out this call to be the presbyterate of Boston, united to Christ, the Good Shepherd, and to our brother priests in the service of God’s people. Together, in our role as priests, prophet leaders, with humility, with courage, and immersed in the Word of God. Let us make our renewal of promises, a new beginning, an opportunity to say yes again to Christ. Fr. Chris said the Cardinal is reminding the priests what they committed to on their ordination and calling them to unity within Christ. If there isn’t unity, how can priests ask others to be a people of reconciliation. The priests need to be united in Christ around the Bishop around the Eucharist, then they are fraudulent. Fr. Barber said priests live that togetherness by calling each other late at night, for example, where their brother priests live alone. They give each other encouragement and hope. The bishop is the chaplain of his priests. Fr. Chris said priestly fraternity begins in the seminary. It is 10 times harder to gather priest friends in the parish when all the demands of the parish are on them. A central characteristic of St. John’s is the camaraderie shared among the men. 3rd segment: The sacred Triduum is the three days in the Church’s calendar when the normal business of the Church shuts down. Fr. Chris said we are all united around the events of Christ’s suffering, death and resurrection. For those three days, our parish church becomes the Holy Land where we walk with Christ. We are in the upper room on Holy Thursday and we come together in the garden as we pray before the tabernacle. On Good Friday is Calvary. At the Easter Vigil we start in the darkness of the tomb and lead to the light of Easter. By celebrating these events we too rise with Christ. Fr. Barber said no one can say that God doesn’t love me when we experience the events of the Triduum. We hear the Lord’s last words and his love letter to the Church in his preaching at the Last Supper. If we wear a crucifix we wear a reminder of how much He loves us. All the beautiful symbolism of the Triduum remind us of the inner mysteries of Christ. Scot said that on Good Friday the veneration of the cross brings us face to face with what Christ did for me. On Holy Saturday, the tangible act of lighting a candle and passing it on and what it means to us as faithful Catholics. Fr. Chris said he ended his homily with John 3:16 and it’s the greatest love story in all the world. His vocation came to him in eighth grade as an altar server serving at all the Triduum liturgies. Fr. Barber said the veneration of the crucifix on Good Friday is a high point for him. He highly recommends the new movie “Of Gods and Men” in which an old monk knows he’s about to die for his faith and he’s praying before an image of Christ. Knowing he’s alone, he goes up to lay his head on Christ’s side and kiss the wound in his side.